Roland Juno Review - Is This keyboard Any Good? Buying a keyboard is hard. How can you know the ins and outs of an instrument just by looking at it online? Or even by trying it out for a few minutes at the store? The simple answer is that you can’t. It just isn’t possible. Identifying the characteristics that matter in a piano can take some real time. Time you don’t have. Time we do have. That’s right. We looked at the ins and outs of this keyboard and assembled everything that we learned in the Roland Juno review that follows. We found out what this keyboard does right, and perhaps even more importantly, we also learned what it does wrong. Read on to find out what we thought! Below you will find some aspects of the board that we really, really liked. A little bit later we will also expand upon some problems that we took issue with. Until then, read on for some things we think you will love about the Roland Juno! There is an asterisk next to this feature. Let’s start with the positive first. The keys themselves play fantastic. They are fully weighted and extremely responsive to your touch. The feel that they produce closely resembles the experience of playing an acoustic. As far as we are concerned, that is pretty much always what you should hope to find in a keyboard. There is a problem though. You don’t get a full set of keys. In fact, the board falls well short. A conventional piano is going to feature eighty-eight keys. You only get sixty-one here. We will elaborate on this problem a little bit later on as we look at the issues. However, for now just bear in mind that the number of keys could prove problematic for you. If you do want to go for the full eighty-eight keys, you are free to do so. However, the company attaches an enormous up-charge to the upgrade. That issue aside, the keyboard is as good as you could hope for. 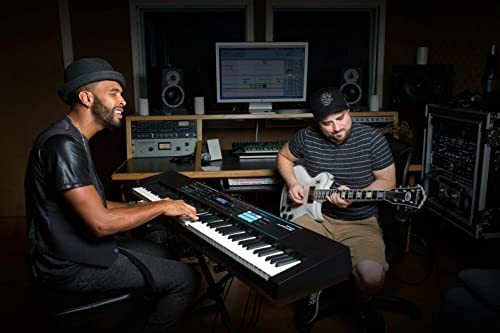 If you are looking for a gig-friendly keyboard, this might be one to think about. The manufacturers clearly seem to have had transportation in mind. The board is lightweight. Weighing in at less than twenty pounds, this keyboard is going to be very easy to take on the go. You also get an impressive recording capacity. The eight-track onboard recording means that you aren’t going to have any trouble saving and sampling your work. The feature lends itself quite well to the musician that would like to explore their creativity. The interface for the recording studio is also quite seamless. The idea with these features is always to make the recording process as simple as possible. That way the artist trying to develop a song will not be inhibited. Roland Juno nails it in that department. Last but not least, the sound library is ever expanding. Users of this keyboard are constantly given the option to download new sound waveforms from the company’s website. These downloads are simple to do, and they are also free. Not a word you see very much, right? Perhaps especially not in the world of music. One thing is clear: promoting creative freedom was a big emphasis with this instrument. While the piano does not do everything right, it definitely excels at that. One of the biggest issues with this board was built into the design. This model was made with only sixty-one keys. The idea was probably to better facilitate transportation. The fewer keys do make the board more portable. We praised this as a pro earlier in our article, and of course stand by that thinking. Still, you should really have a full keyboard. If you are a serious pianist, you do need all eighty-eight keys to enjoy uninhibited playing. The other issue was the quality of the tones themselves. We found that the sound library was pretty good, but also not great. It is especially capable of generating good synth and organ tones. They have clearly put a good deal of emphasis on that. However, when it comes to actual piano tones, the keyboard really does fall short of other options. If sound quality matters a lot to you, you may find yourself disappointed with this option. One other small thing we found might not be an issue persay. Just something that you will want to keep in mind. We noticed that the interface was a little bit complicated. Ideally, keyboards are going to be able to be used intuitively. The hope is always that navigating the board will be as simple and straightforward as possible. That isn’t what we found here. Is this a deal-breaking issue? Absolutely not. In fact, it might not even reflect the experience that you have with the instrument. Everyone experiences their keyboards a little bit differently. We mention it simply so that you can expect to encounter a learning curve. These things aside we did not find anything to complain about. The keyboard itself is actually quite good. Unfortunately, the cons we did find may be quite serious to the shoppers that take issue with them. Now that the review is over, let’s summarize our findings as we take a look at some pros and cons. Read on! 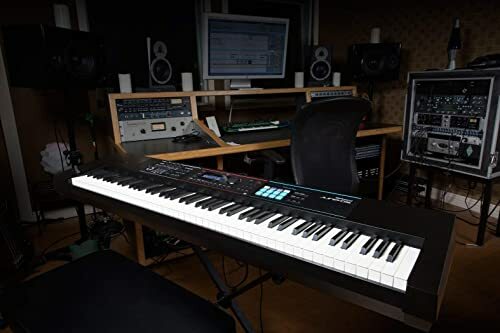 How you feel about the Roland Juno is going to depend largely on what kind of buyer you are. If you are looking for a moderately priced board you can gig with, this is something to consider. Synth users will find plenty that is worth admiring. But what if that isn’t you? Unfortunately, the features here don’t translate well for advanced, traditional playing. The issue is inherent to the setup. Sixty-one keys simply are not enough for an advanced pianist. The bottom line is that you will just have to decide what type of buyer you are.